Acne is the most common skin condition during 12 to 28 years of age. It occurs due to age related hormone changes . Many people get it even up to 32-35 years of age. Apart from basic medical treatment which includes various creams, face washes & oral medications, we at “Genesis” offer following advanced therapies. 1.) ALFA & BETA HYDROXY PEELS :- Glycolic acid, Lactic peels, Salicylic & Mandelic acid are commonly used chemical. This is a walk-in treatment which takes 20-30 minutes. It is advised to avoid excess sunlight next day . 2.) CRYOTHERAPY :- This is also known as cold therapy. Liquid Nitrogen gas is used to treat big & pus filled pimples. The skin is freezed till 10 to 20 0C for few seconds. Patient will have slight pricking sensation which is tolerable. 3.) 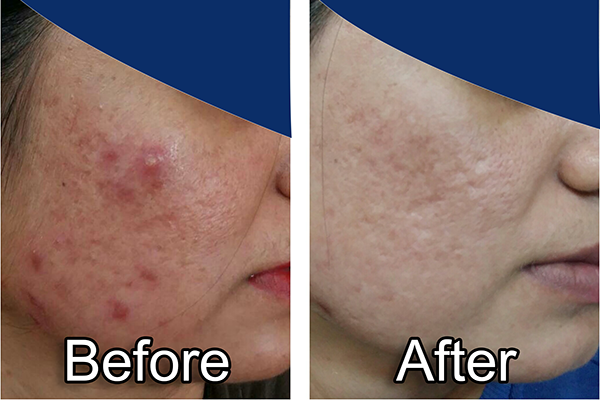 Intense Pulsed Light (IPL)-Laser for Acne :- IPL gives most promising results in non-responding bigger sized pimples on face & back. This is a non-surgical light wave which targets oil producing glands present in the skin. It is seen that after 3-4 sittings of IPL these glands shrink by 50-60% and so activity of pimples also decreases. At the same time it reduces spots & pits leaving overall fresh looking & glowing face. 4.) I.Clear/Blue light therapy :- Blue Light (400 nm) is quite beneficial for pimples. It requires 4-6 sittings at an interval of 3-5 days. This is non painful, no down time, walk-in treatment at very reasonable cost. 5.) Safety & Pain factor :- This treatment is absolutely safe & almost pain free solution for pimple free and glowing skin. This is an In-CLINIC WALK-IN TREATMENT which takes approximately 45 min.